The Navajo Code Talkers Saved Our Behinds! The code that was created at Camp Pendleton was as ingenious as it was effective. It originated as approximately 200 terms—growing to over 600 by war’s end—and could communicate in 20 seconds what took coding machines of the time 30 minutes to do. It consisted of native terms that were associated with the respective military terms they resembled. For example, the Navajo word for turtle meant “tank,” and a dive-bomber was a “chicken hawk.” To supplement those terms, words could be spelled out using Navajo terms assigned to individual letters of the alphabet—the selection of the Navajo term being based on the first letter of the Navajo word’s English meaning. For instance, “Wo-La-Chee” means “ant,” and would represent the letter “A”. 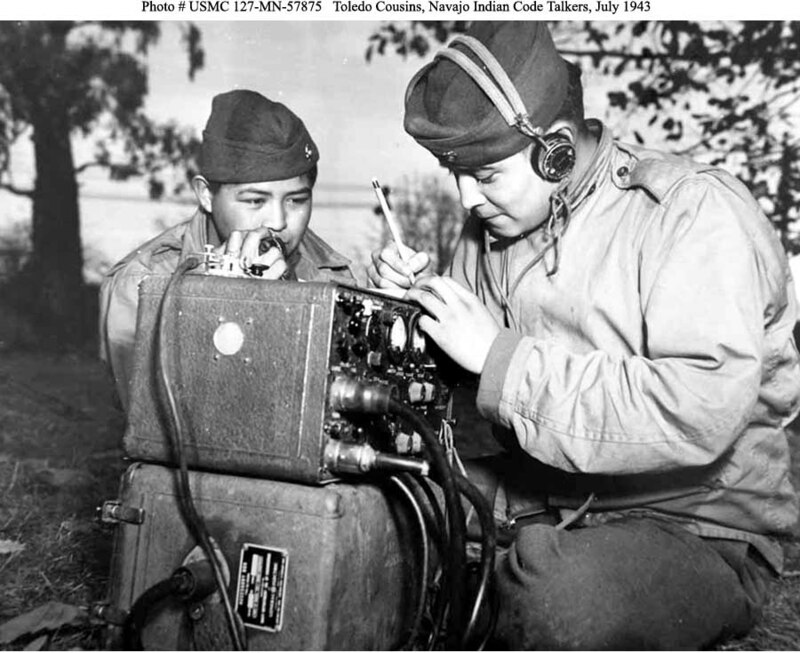 In this way the Navajo Code Talkers could quickly and concisely communicate with each other in a manner even uninitiated Navajos could not understand. Once trained, the Navajo Code Talkers were sent to Marine divisions in the Pacific theater of WWII. Despite some initial skepticism by commanding officers, they quickly gained a distinguished reputation for their remarkable abilities. In the field, they were not allowed to write any part of the code down as a reference. They became living codes, and even under harried battle conditions, the men had to rapidly recall every word with utmost precision or risk hundreds or thousands of lives. In the battle for Iwo Jima, in the first 48 hours alone, they coded over 800 transmissions with perfect accuracy. Their heroism is widely acknowledged as the lynchpin of victory in the pivotal conflict. Native Americans have fought valiantly to protect us during many battles. We thank them from the bottom of our hearts.